Female mechanic fixing stuff. A female wearing a black skirt and heels doing repairs under the front of an old car from the early 80\'s. A female wearing a black skirt and heels doing repairs under the front of an old car from the early 80\'s. Photo of a beautiful female mechanic wearing overalls and standing in front of a motorcycle. Photo of a beautiful female mechanic working on a motorcycle wearing overalls, holding a large ratchet and smoking a cigarette. Photo of a young beautiful redhead mechanic wearing overalls and holding a wheel. Attached property release is for arm tattoos. 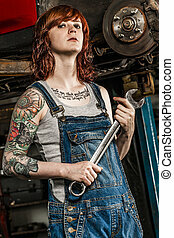 Photo of a young beautiful redhead mechanic wearing overalls and holding a huge wrench. Attached property release is for arm tattoos. Photo of a beautiful female mechanic wearing overalls, leather bra, and sitting in front of a motorcycle smoking and holding a tool. 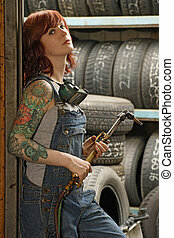 Photo of a young beautiful redhead mechanic with tattoos and wearing overalls fixing the brakes on a car. Attached property release is for arm tattoos. 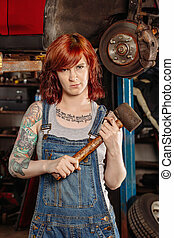 Photo of a young beautiful redhead mechanic wearing overalls and holding a huge rubber mallet. Attached property release is for arm tattoos. 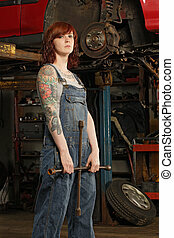 Photo of a young beautiful redhead mechanic wearing overalls and working on a car up on a hoist. Attached property release is for arm tattoos. 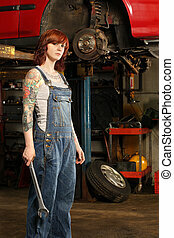 Photo of a beautiful female mechanic working on a motorcycle wearing overalls and holding a large ratchet. Photo of a young beautiful redhead mechanic wearing overalls and holding a welding torch. Attached property release is for arm tattoos.